I went out to Land Bank this afternoon for an hour to see what activity was going in Haro Strait. The first thing I noticed when I arrived was all the sport fishing vessels out there, and sure enough, upon closer inspection, I saw there was lots of wildlife taking advantage of what looked like good fishing on this first day of October. A couple of rhinoceros auklets were diving, and about twenty gulls were taking advantage of the resulting bait ball from the surface. In the mixed species flock were glaucous-winged, Heermann's, mew, and California gulls. Several harbor seals were in the vicinity, and offshore I heard and then saw a Steller sea lion surfacing. Closer to the rocks, a group of four harlequin ducks were diving and feeding, too. I wonder if it was the exactly same animal with the chopped fin that I saw today? It seems plausible, especially since it's the same time of year and the same place. 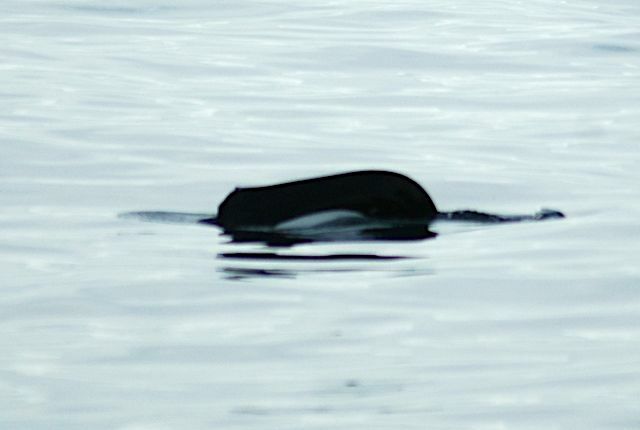 We're spoiled a little with the orcas that can each individually be identified. Sometimes I wonder more about the individual lives and habits of our regional Dall's and harbor porpoise, that we don't get to observe or study in such detail. 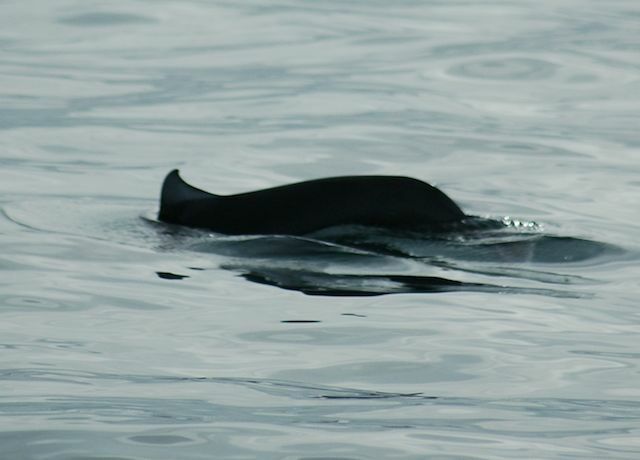 Dall's porpoise can live to be 15-20 years old. Locally, they used to be common all summer, until the last couple of years when they seem to leave the area in the summertime until returning in great numbers in September. Too bad the chopped-fin porpoise today was a little too far away for a photo, but I'll keep an eye out for it over the next few weeks to see if it's hanging around. By the way, did I mention I saw all the wildlife listed in this blog post in about 10 minutes? It was quite a feeding frenzy out there! The orcas were around, too, but well to the south out of view, where I heard that they were also foraging. Whoa. Interesting stuff. Can't say that I've seen enough Dall's to be able to weigh in on the photos--you're a far better judge! Hey, here's a link to a photo I think you'll appreciate: http://www.guardian.co.uk/environment/gallery/2011/sep/30/week-in-wildlife-in-pictures#/?picture=379720342&index=15 Photo #16 is a white humpback whale calf!